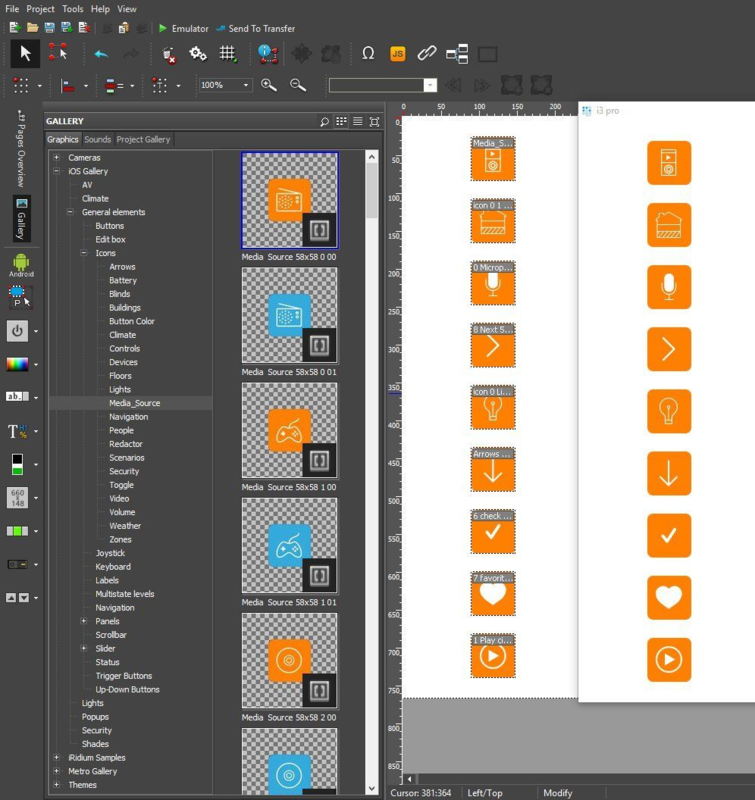 In the graphic editor «iRidium studio» you can create a visualization project – an interface linked with equipment control commands. In the «i3 pro» application you start the project on Android, iOS, OS X or Windows devices and control the equipment. Such devices are called control panels or panels. In «iRidium server» you can store scenes, schedules, logic, databases. It enables functioning of the automation system 24/7. In «iRidium cloud» ready projects for remote download and licensing are stored. To combine control of automation systems, AV equipment and IoT devices in one project. Additionally you can display stream video, integrate SIP intercom, send messages to messengers and e-mail addresses, etc. To create unique control interfaces when taste of your clients go beyond the scope of ready visualization templates and logic. iRidium pro enables to balance aesthetic preferences and functionality demands in the interface. The name of the controlled equipment can be forgotten by the client but he sees the control interface every day. iRidium pro is used by professional integrators – people who install and program Smart home and Smart office systems, Home Theaters and any automation systems. The number of IoT users grows together with the market of IoT devices and interest to it. 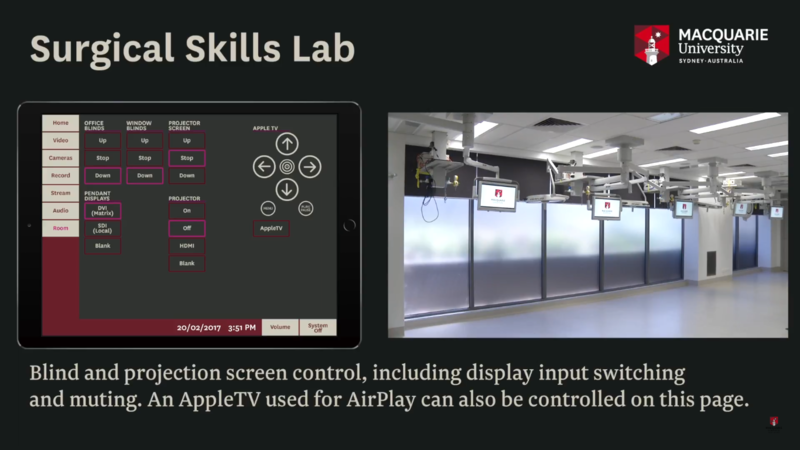 For example, more often than before installers who work with low current systems and were not engaged in building automation come to iRidium mobile trainings. iRidium pro can be used in home and commercial automation. Offices, apartments and buildings controlled with iRidium pro can be found all over the world: in a private apartment in Moscow and in the amusement park in South Korea. If equipment is set up correctly, it is trouble-free. If it is trouble-free is it easy to forget its name.There is no need to remember something that works on the background. It works differently with interfaces. The interface should be trouble-free and be well-liked by a particular person. The control interface just like the design of your home is selected individually. 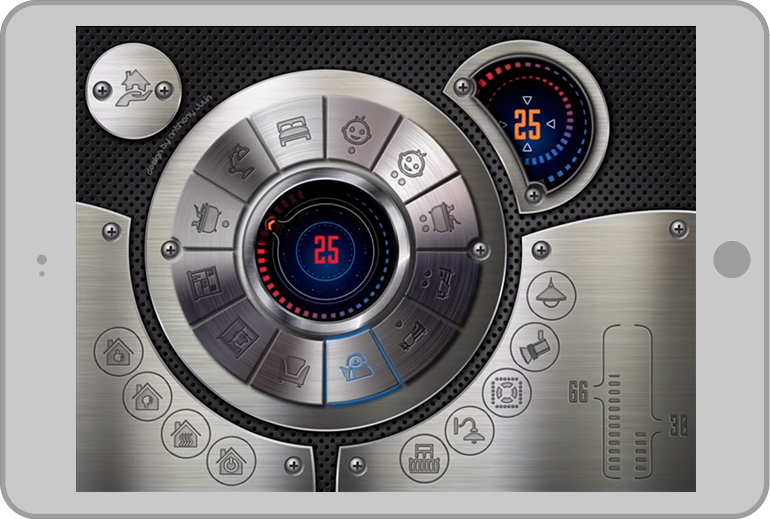 The interface is formed in iRidium studio and consists of control items, images, sounds and popups with hide and show effects. You can create a project in horizontal or vertical orientation for your tablet or phone. You can create a turning interface, set up changing its pages by swipe and many other things. To send commands and display feedback you can use: buttons, levels, triggers, trends, joysticks, animated buttons and levels. You can program not only pressing and releasing the item but also send commands by gestures or in cycles on hold. Security is provided by the 4-level password system. Some pages should be available only to the house owner, for example, control of his study or boiler room. You can block control – open a screensaver by timeout and then request the password to continue the work. 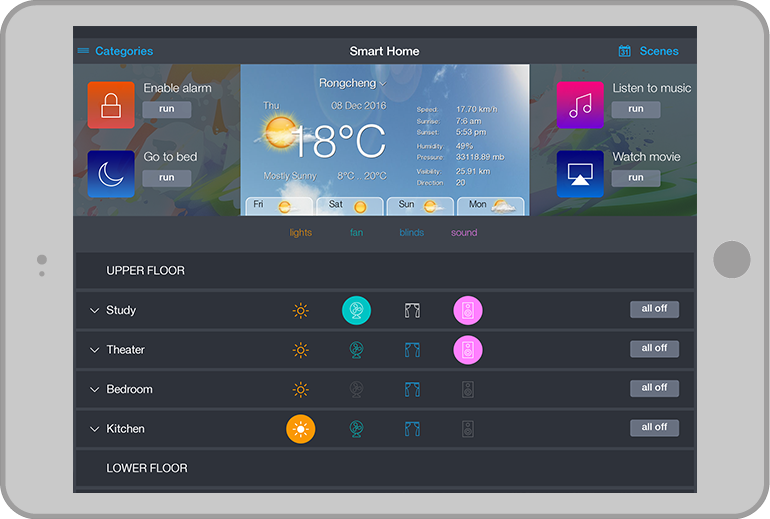 To save time at interface creation you can use ready items from the editor gallery: icons for all Smart home functions, different styles of ready pages to control AV equipment, links to images from cameras. You can also form your own gallery and use it in your projects. The built-in tools of iRidium studio are enough to create a beautiful and functional interface. But if you need more, then you can add some functions to your interface with the help of JS programming. If you do not want to create your interface from scratch, you can use ready interfaces from the web site. Then you do not need to think how to position buttons, what colors match, what font size should be used to sign items, how to set up navigation in the project and etc. There are free and commercial, light and dark, home and office interfaces. You will be able to customize them after the iRidium pro basic course. It is also one of the ways to make a profit off of iRidium pro: anybody can create an interface and place in for selling. See interfaces of existing projects to get inspired and evaluate capabilities of iRidium pro. The start page of the Chart interface provides quick access to all rooms from one page. The interface is available for purchase. Sometimes impossibility to use some equipment because of its incompatibility with other system elements can be the limiting factor. In iRidium pro equipment is controlled by drivers. A driver is a special program which converts user commands to the protocol of the controlled equipment and enables sending commands to the equipment and getting feedback from it. 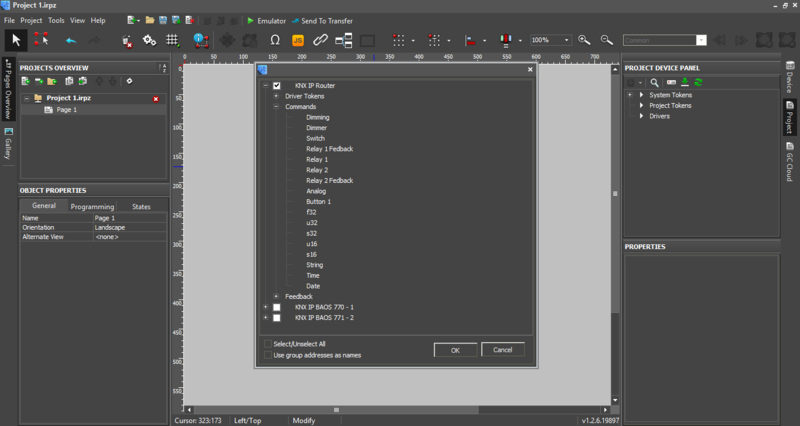 Drivers are divided to native (built-in) and script (modules). The database of built-in drivers includes drivers for control of equipment: AMX, Bacnet, KNX, HDL, Crestron, Domintell, Duotecno, Modbus, Global cache, Helvar, Beckhoff ADS, ELCO EP iNels. The list of supported equipment is constantly grows. The built-in drivers just like the interface are set up in iRidium studio. They are standardized, have detailed documentation and examples. Work with such drivers is easy and fast. For example, channels for control of KNX equipment are added with the help of project import from ETS and channel for control of HDL equipment are added with the help of the scanner. After adding the channels you need to input the settings for connection and the driver is ready for use in your project. Import and scanner functions are also available for Crestron, Modbus, Clipsal, BACnet, Duotecno, Domintell drivers. iRidium pro has full compatibility with TP4 and TP5 projects for control of AMX equipment — you can download them on the panel directly, without import. Or you can add some additional functions in them in iRidium studio. Thanks to the partnership with the Global Cache company the integrators have access to the private database of IR commands. 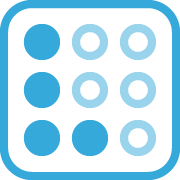 It helps to save time on searching for control codes for different TVs, projectors and conditioners as you can add them directly from the database using drag-n-drop. 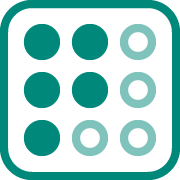 storing numbers, strings and data arrays in the memory of the control device. when the i3 pro application comes from background the network is overloaded because of start request of all drivers. iRidium server serves to overcome these limitations in iRidium pro. iRidium server WB 6 Zero. The hardware platform is selected depending on the size of the automation object and required functions. For example, when using iRidium server UMC, the server can receive and send commands via the KNX TP1 interface, serve as a KNX IP router and connect directly to the HDL buspro bus. You can see detailed information about each type of server on the web site, in the “iRidium server” section. iRidium server controls drivers just like panels but it monitors the system 24/7. After connecting to the server the panels receive statuses of channels/sensors/meters from the server without sending requests to the bus. Schedules, logic, rules, intellectual gateway function for the server project are created in iRidium studio. Values of variables are saved in the SQL database. You can save values coming from equipment or create virtual variables and save data from panels and scripts in them. For example, you can store the value of the comfortable temperature the client sets in the control interface. Output of the saved data is available as a trend on the panel or in the iRidium server web interface. If there is some emergency iRidium server can send a PUSH notification to the Android or iOS based device with the running i3 pro application, an e-mail or a message to the messenger. Use of iRidium server does not increase the price of the licenseне — it can be included in the project at any time. The testing mode is free for all integrators. The Тest Mode license is uploaded automatically after signing in i3 pro or in iRidium server. It enables integrators to set up work of the project and make a well-considered decision before the purchase. There is also a free 60-days trial period of when the project can be tested by the client. Commercial licenses are divided by types. Each type supports a particular number of control panels which control the automation object. If the object includes support of the server, then each license type supports a particular number of server tags. For example, if you have a control project for an apartment on 1 built-in panel and 2 phones of the hosts, then the number of used panels is 3 and the license type to be used is Basic. The license price is calculated with the help of the online calculator on the website. Besides the license type the price is affected by the drivers used to control the project. For example, a license for control of AV equipment from one panel costs 150 USD. And for control of KNX and AV equipment from 5 panels — 600 USD. Integrators get discounts on licenses depending on their status: Gold, Silver or Bronze. Integrators with Gold status have 40% discount, with Silver — 33% and with Bronze — 20%. After registration on the web site all integrators automatically get the Bronze status. Then their status changes depending on the sum of purchases they make for the last year. New iRidium pro integrators have additional bonuses – if they successfully pass the test after online or offline trainings, their status changes to Silver for 3 months. If they buy anything during this period, they get the Silver status for a year. We are interested in integrators who put their knowledge to practice right away so time spent on trainings wouldn’t be wasted. Integrators select iRidium pro both because of flexible interfaces and integration with different protocols. iRidium pro protects intellectual property of the integrator using the project encrypting function in iRidium studio. The encrypted project cannot be opened and edited in iRidium studio, it can only be started in the i3 pro application. The project in this format can be given to other integrators and clients without being concerned that somebody might use your solution. In iRidium pro you can refer to any interface or driver parameter with the help of the JS language. It can be used by those integrators who need something more than standard functions to create complex communication logic. But it is an additional feature as none of the necessary settings of fully-functional and beautiful project requires use of scripts. The free interface in the iOS style has 1 script: to send color to channels controlling the DMX strip. In order to use it you need to enter the channel names from your project. iRidium pro saves your time on transferring projects to end users via the cloud. There is no need to come to the automation object when you need to update the project. If your client loses his phone, then you just need to download i3 pro on a new device and sign in – all projects will be available for download from any part of the world. We train integrators to work with iRidium pro on offline and online courses. We have 2-days trainings in Moscow every month and the online course is available at any time you like. There is also a training on scripts which takes place in Moscow. Offline and online courses save the integrator’s time both at start and during work – as there are fewer questions to technical support. 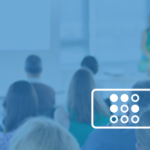 At that after the courses integrators get an additional bonus if they pass the test successfully – the Silver status. Also, our company has webinars with presentations of Smart homes, new trends of the automation market, etc. We help to present Smart home with the help of the “Virtual Smart Home” demo project. The project with the virtual apartment run on a PC and the project with the interface to control the apartment runs on a mobile device. The projects communicate through the server running on the PC. When you open a room in the control interface, the same room is opened in the apartment. And you can virtually turn on/off the light, control music, TV and climate. 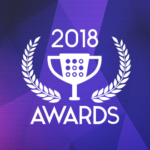 For 5 years we have been holding the “iRidium Awards” project competition. Any integrator who has iRidium pro in the project or created a control interface can participate in the competition. The winners get prizes: discounts on licenses and Apple devices. We create new products based on demands of integrators. 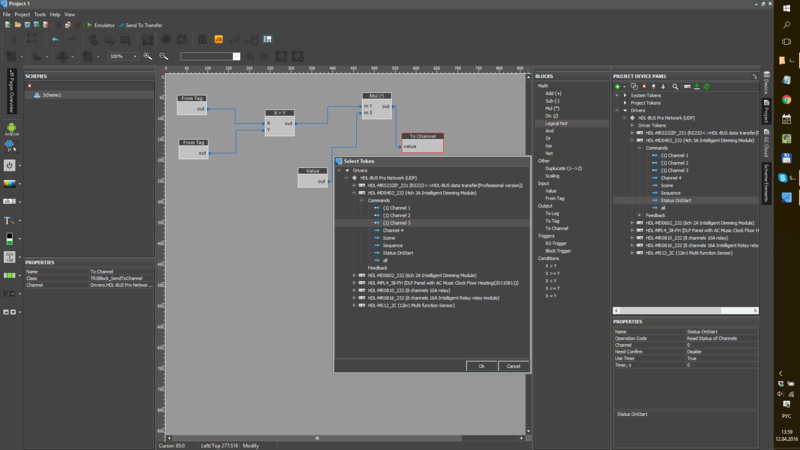 For example, iRidium lite – with its help you can create a control project directly on the control panel, without using the editor on PC, though there is no possibility of free programming and creating unique interfaces. See more information about iRidium lite in the article “iRidium lite: new “dream app” for home automation professionals” and comparison of iRidium pro and iRidium lite in the end of the article. 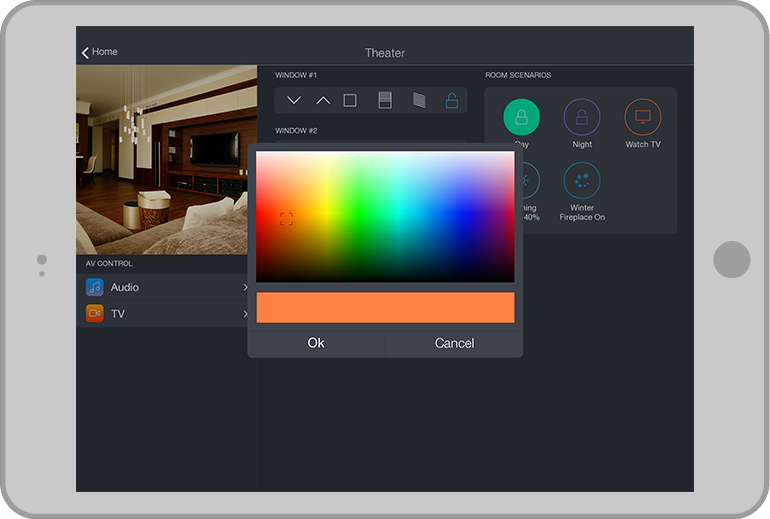 iRidium pro is a product for professional integrators who install and program a Smart home and Smart office systems, Home Theaters and any automation systems. It is used anywhere you need automation coupled with flexible visualization. Fast setting up of drivers from ready database, creation of drivers for any equipment controlled via TCP, HTTP, RS232, UDP. iRidium server helps to organize control 24/7, PUSH notifications, schedules, rules, communication between drivers, storing and displaying values. There are free licenses for integrators to debug projects and for end users to test them. Commercial license are divided into 5 types. Each type supports a particular number of control devices and server tags. i3 pro has additional features that make things easier for the integrator: project transfer to the end user via the Internet, project encrypting, offline and online trainings, the “Virtual Smart Home” demo project and etc. P.S. In the article we told you about the main capabilities of iRidium pro. If you are interested, then have a look at 30-minutes“Introduction to iRidium pro” course. You will learn how to start work with iRidium pro, its components and licensing system and the way of the the integrator from registration tо transferring the project to the end user. Standard installations, standard GUI and logics. Control from a user’s gadgets, that are constantly changed. Complicated installations, unique GUI and logics, Control from wall-mounted panels, that are changed seldom. Works with and without the central controller. If a controller is used, there is no need to set it, the app sets it automatically. Free programming is not supported. Works with and without the central controller. If a controller is used, it is separately configured in the editor on PC. Free programming is supported. for the server after activation. 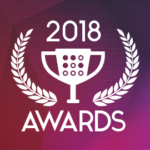 iRidium Awards 2018 Project Competition is Opened!